The next piece of armor the Lord gives us at the moment of salvation is the Breastplate of Righteousness. The breastplate is an important piece of armor covering the torso. The torso is the main part of our body from which extend our neck, arms, and legs. Why do you think it is important to protect our torso? Where is our heart? Our heart is located under our ribs in our chest. Our lungs, stomach, liver, kidneys, and other important organs are also located in our torso. The torso needs to be protected in battle. In ancient times the breastplate was usually made of either, leather, bronze, or iron. 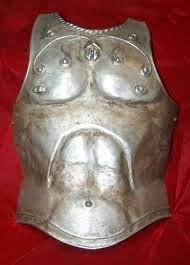 In our day, the breast plate is called a bullet proof vest. 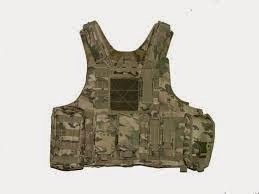 Our soldiers and police officers wear these in combat situations. Men and women wear these to protect their vital organs in battle. A sword, knife, or bullet cannot pierce it. The vest can be uncomfortable to wear especially in hot weather but it is important to have the vest on. 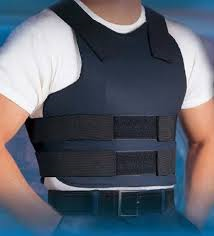 A soldier or police officer should always wear the vest when they encounter the enemy. The vest could save their life. As God’s children, we should wear our armor to protect us against our enemy the devil. Remember in our last lesson, I told you our fight is against Satan or the devil. 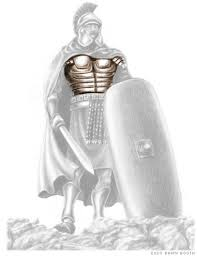 We need to put on the breastplate of righteousness to protect us against Satan’s attacks. He shoots fiery darts at us and our breastplate protects us. The Bible calls it the Breastplate of Righteousness. Righteousness is the quality or state of being righteous. Being righteous is characterized by uprightness or doing right, in other words a godly person. God has standards and when we live according to those standards we are righteous. Doing what we know to be right or aligned with God is being righteous. At salvation we were given our breastplate of righteousness. When we do right or obey God, we are wearing the breastplate. When we are not doing right or disobeying God, we've taken it off. Satan wants to injure us. Satan’s darts might be lies about our relationship with the Lord—how God views us. The darts may be temptations to do wrong or bad things. It could be bad thoughts. Satan knows how to attack us, so we need to be ready. When we wear our breastplate, we don’t have to fear Satan's attacks on our heart. His darts cannot hurt us. That’s why God wants us to make sure we wear the armor at all times. Sin or doing wrong things like lying, stealing, disobeying our parents, and being mean to others causes us to not have our breastplate on. We need to make sure we don’t make those bad or sinful things habits that will make us vulnerable to Satan’s attacks. The Bile says we need to guard our hearts. We need to love and serve the Lord with all our hearts. The Lord wants us to have discerning hearts, hearts that understand and do right. We should meditate on God’s word with not only our minds but our hearts as well. The Bible also tells us to have pure hearts. That means hearts without sin. A cheerful heart is a good medicine. Our hearts lead us to make decisions. The breastplate is an important and vital tool to protect our heart. Our verses to memorize while we study the armor of God are in Ephesians. We will study the armor for many weeks. Please work on these and try to commit these to your memory.